Whether we like it or not, we spend good chunk of our lives typing, and the more we do it with bad form, the more we’re setting ourselves up for chronic pain, or at least extremities that are taut, achy and uncomfortable. The best ergonomic keyboards take steps to stop hand, wrist and shoulder pain in its tracks, as well as reducing the likelihood of conditions like Repetitive Strain Injury. Buying an ergonomic keyboard is usually a case of choosing between a comfort curve – think the keyboard as imagined by Salvador Dali – and a split keyboard. Both have their merits, healthwise, so it’s all a case of which layout you think you’ll be most comfortable with and the performativity of individual products, which is where our list comes in. These models are designed to fit around your hands, enabling your appendages to rest in a natural position for comfort and all-round postural health, and we’ve collected together a few of our favourites for 2018 so you can find the computing accessory that works best for you. One of the latest designs from Matias is the Ergo Pro, shooting for a bisected, ALPS-inspired design, this model has arranged the navigation keys in their traditional pattern, but lays them out horizontally. 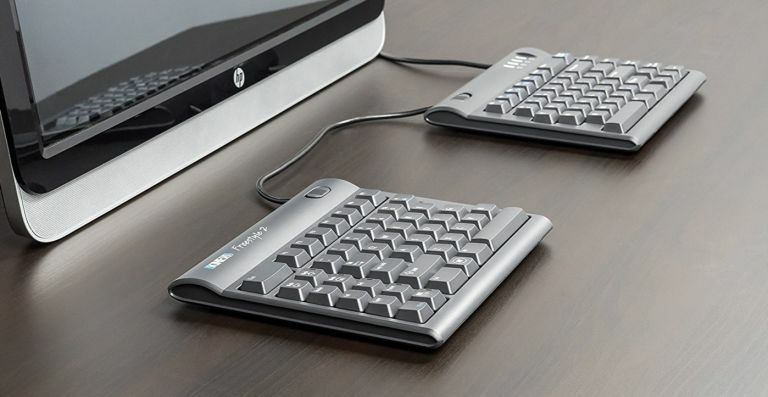 It also positions them along the bottom row, more like a laptop keyboard, making it a little odd to use to begin. However, once you get used to it these design choices make total sense and won’t stand in the way of long typing sessions. It also makes use of Matias’ bespoke Quiet Click mechanical switches that give you that clacky feedback, but removes most of the sound thanks to some rubber keyswitches. Perfectly suited to Microsoft’s Surface range (but still compatible with most other Windows-based machines), this ergonomic keyboard is a wireless affair and operates up to 32-feet away thanks to Bluetooth 4.0/4.1. The layout of the keyboard is your standard QWERTY setup, but its curved geometry facilitates a really comfortable experience that won’t leave you feeling sore after a day’s furious typing. Double padding on the arm rest provides that little extra layer of luxury, while something a simple as a split spacebar makes touch-typing a breeze. Those rests are also stain resistant, just in case you slurp a little too much coffee while you’re working. The ergonomic keyboard corner of the PC peripheral market, much like any other, has its fair share of ultra expensive and mid-range models, but that’s not to say everything in the ‘budget’ range is a load of tat. Vitalitim’s ultra thin device is one such alternative, offering you 2.4Ghz, cable-free connection that’s mostly clear and concise up to 10 metres away. It’s lightweight and features a thin, low profile, but it also packs in an impressive 110 keys, including 12 hotkeys for those all important shortcuts. The signal can be a little choppy, and its design won’t take too much punishment, but it’s brilliant considering the low asking price. The latest offering from Mistel aims to cross the divide between traditional ergonomic keyboards (which strip out features in favour of comfort) and full-fat mechanical keyboards with their clacky feedback. The Barocco, on the whole, marries the two pretty well with Cherry MX Switches as standard and a temperature-resistant build that ensures it can survive most punishment. The split design works well, helping negate the overall strain of using a regular keyboard for too long. The RGB backlighting offers 11 different modes, while the inclusion of macro-based hotkeys gives you the scope to customise those all important shortcuts. Logitech’s contribution to the mid-to-expensive range of the market is another model that aims to marry two seemingly incompatible elements - the affordable asking price for a smaller spec model with the robust feature set of a higher-end keyboard. The result is the K350, which manages to be both extremely comfortable to use for both short and long sessions, AND versatile thanks to curved ‘wave’ keyboard layout and a set of customisable macro keys. Unfortunately, the placing of these multimedia buttons leaves a lot to be desired, making them a little awkward to use for a model designed to reduce strain. While being one of the more affordable models on our 2018 list, the Tru-Form 150 from Adesso manages to surpass the remit of its price range with an impressive set of built-in features. Including a raft of multimedia keys, a ‘wave’ layout and split-design that places your hands on either side of a comfortable bump in the middle. The keys also have a larger, 2x font making them ideal for users for poor eyesight. The design can feel a little plasticky, all the keys a little noisy for a non-mechanical keyboard, but it’s still a decent peripheral for your home or office setup. While the Microsoft Surface was designed with - you guessed it - Microsoft Surface devices in mind, the Big M has made sure there’s another more versatile keyboard for the ergonomic crowd. The Sculpt combines design elements from both split and traditional layouts, resulting in a robust if aesthetically unappealing model. The tilt of its keys makes for very comfortable experience, while the included ergonomic mouse and separate numerical keyboard make for a setup that’s perfect for almost any kind of non-gaming task. If you’re looking to reduce RSI with a full keyboard and mouse combo, this is an easy sell. The second generation Freestyle from Kinesis keeps the same segmented design that made it such an ergonomic-centric design to begin with, while adding in a few extra touches for 2018. The new model is noticeably slimmer, its lower profile feeling that bit more comfortable to use than the first Freestyle. Its connective cable is 9-inches long but there’s also a 20-inch version if you want even more space between your keyboard components. The model's keys don’t offer the nicest feedback, especially after long periods of use, but with Bluetooth connectivity and versions for both PC/Linux and Mac, it’s a decent if pricey package. When it comes to gaming-focused keyboards, comfort almost always comes second to performance, but that’s not to say there aren’t some models out there with some support for ergonomic users. The Razer Ornata Chroma Revolutionary packs in mechanical switches, anti-ghosting and all manner of macro keys for customisation. The big selling point for users wanting a more comfortable experience is a durable wrist rest that elevates your hands and takes off much of the strain associated with extended use. While not a keyboard designed with ergonomics first and foremost, it’s certainly one of the most comfy to use in the gaming sphere. Combining both a split-key design with the contours of a 3D build, the Perixx Periboard-512 II might look a little odd (and boast an equally ugly name), but it makes for a robust keyboard that belies its affordable, sub-£30 price tag. It’s a little bigger than the rest of the keyboards on this list, so it’ll take a little getting used to, but once you’re comfortable with its contours you’ll find it a pleasant and responsive bit of kit. Add in some USB 2.0 hubs with seven multimedia hotkeys and you’ll find this Perixx peripheral and easy sell for those worried by RSI symptoms or those already suffering from the condition. More Microsoft? You bet. This ergonomic option from Bill Gates’ brainchild is a bit beefier than the other two brand offerings in our list both in terms of build and functions, and makes a better bet for those who prefer traditional elevated keys to almost-flush ones, but don’t want to sacrifice the more comfortable wrist and arm alignment of an ergonomic keyboard. For the keyboard shortcut aficionado, this is a veritable smorgasbord of functionality, with an intuitive zoom slider, one-touch commands like Open and Reply, and media keys. The Kinesis Advantage2 LF takes the split keyboard design to the next level, with its deep concave and huge gulf between the two sets of keys. But, despite a pretty steep learning curve, reviewers said it was the most comfortable keyboard they’d ever tried, all thanks to that unique layout. Well, and probably at least a little to do with the plush raised palm rests too. Mac users can switch easily with included extra keycaps and a simple keystroke command for a quick setup with no Preferences menu in sight, and the keys are both reprogrammable and mechanical, with an incredibly satisfying clack courtesy of Cherry MX Red Switches. Gaming keyboards are great, but you're often lumbered with chunky designs that either don't pack away well or make your wrists and tends sore after extended use. The GameSir One-handed Mechanical Gaming Keypad aims to fight this with a compact design that takes all the major keys you're likely to need and packs them into one ergonomic layout. The result is peripheral that's comfortable to use in conjunction with a mouse, and one that's ideal for packing away when gaming on the go. It has 29 Cherry MX Red Key Switches, RGB lighting and more so it's still a proper little gaming keyboard in its own right.